1. Focused approach: Conéctate concentrates on what Introductory Spanish students can reasonably be expected to learn, allowing for sustained engagement with the material that respects the natural process of language acquisition helping faculty to move students toward a more communicative classroom. 2. Active learning: Conéctate gives students the opportunity to explore language and culture through interactive activities that keep them focused and engaged. By making students active participants in their learning, Conéctate helps faculty with student motivation and participation in class. 3. Integration of culture: Building on the active-learning theme, students develop and apply critical-thinking skills as they drawpersonal conclusions about the rich culture presented throughout Conéctate. Captivating videos and readings support students in their quest to better understand the Spanish-speaking world. 4. Recycling of vocabulary and grammatical structures for maximum exposure is a key feature of Conéctate. In crafting the progression of activities, a natural progression of the level of difficulty of the grammar has been carefully considered, allowing instructors to seamlessly incorporate the language-building process into their class time. 5. 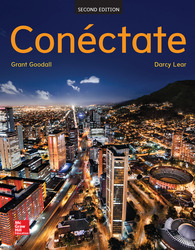 Improve student learning outcomes by pairing Conéctate with the Connect platform, LearnSmart, grammar tutorials, and other digital resources. Capítulo 4 ¡Qué bonita familia! Capítulo 9 ¿Adónde te gustaría viajar? Capítulo 11 ¡Estás en tu casa!